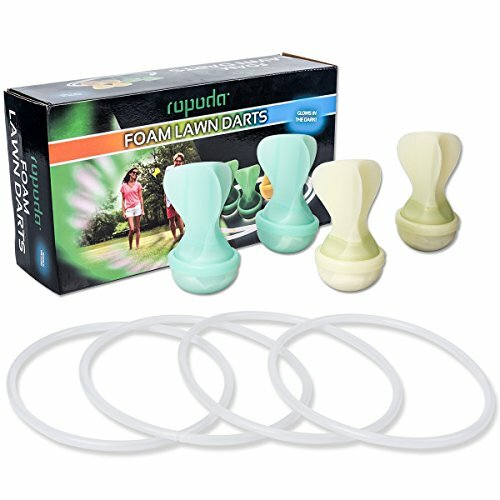 This glow in the dark Lawn Darts game is a safe and fun way to entertain. Whether you have kids or not and just want to use it at get together's with other adult friends. you will surely have a blast playing it ! During each round of play, 1 player from each team stands in the "Toss Area" and alternates throws their 2 dark target darts in the rings. You can make each dart made inside the ring count for points or you can play without keeping score. Bringing along a set to play is sure to liven up any beach day, backyard get-together, or outdoor party and provides entertainment for your family and friends for memories that will last a lifetime. GREAT GAME FOR EVERYONE - This lawn darts game are not only fun for kids, also adults can have a lot of fun with it. From grandkids to grandparents, all are having a blast with this game. The darts game is easy to play. you simply toss the dart and try to get it in the circle. HIGH QUALITY AND HARMLESS - Lawn darts outdoor games are made with high-quality plastic compound material that is crack and damage resistant for long-lasting fun, and the four darts are made with reliable night-luminous material. So get the whole family involved! PORTABLE AND CONVENIENT - This yard game set includes 4 soft darts with two different colors and 4 soft rings. It is lightweight and compact, making it easy to transport and store. Simply open the box and have a game set up in a matter of seconds. SATISFACTION GUARANTEED - If you have any problems for this item,please feel free to contact us and we'll try our best to help you. ROPODA is committed to providing consumers with the absolute best price and value on our entire line of products.